Look out the legwarmers and get set to light up the sky like a flame as Fame the Musical is revving up for a spectacular four-day North-east run. Following the highly-acclaimed, near sell-out production of Hairspray in Stonehaven last year the enthusiastic Ma Simpson’s Productions cast have been busy rehearsing their stage version of the 1980 film hit Fame. The show, which spawned a huge six-season TV series success, is being staged at Stonehaven Town Hall from June 8-11. Fans can enjoy a sneak preview when cast members showcase their talent in two spots at Stonehaven Feein’ Market in the town square on Saturday, June 4. The team behind the all-singing, all-dancing musical have already had a boost towards the expensive production with a £2,000 grant from Aberdeenshire councillors on the Kincardine and Mearns Area Committee. Organiser Chris Stirk, who runs her own real-life Fame-style talent classes in her Stonehaven music shop, says the team hope to upstage last year’s Hairspray success which sold more than 1,200 ickets. She said: “I can’t believe how good this cast has become over the last few months. It’s going to be a great show. “At the last rehearsal I have to admit at one point I had tears in my eyes to see how well they have come together. Fame the Musical tells the story of several students who attend the High School of Performing Arts in New York. Among them are fame-obsessed Carmen (Leigh Ryrie); ambitious actress Serena (Jenny Ward); wisecracking comedian/bad boy Joe (Gregor Cameron); quiet violinist Schlomo (Edward Dickens); “talented but dyslexic” dancer Tyrone (Brian Maitland); determined actor Nick (Michael Barrie); overweight dancer Mabel (Eilidh Watt); talented ballet dancer dancer Iris (Jill Shearer); tomboy band drummer “Lambchops” Lamb (Ava Harding) and talented musician “Goody” King (Zach Roberts). 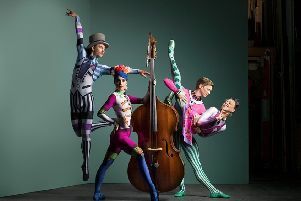 It also features Performing Arts High School teachers Susan Hughes, Roslyn Campbell, Janice Ingram and Lesley Higgins. Director/producer is David Johnston, director is Susan Hughes, musical director is Colin Grant and choreographer is Kelly Nicol of Aberdeen’s Sharon Gill School of Dance. Tickets are available from Ma Simpson’s, Evan Street, Stonehaven, or online at www.masimpsons.com.